To four girls who have nothing, their friendship is everything: they are each other's confidants, teachers, and family. The girls are all named Guinevere-Vere, Gwen, Ginny, and Win-and it is the surprise of finding another Guinevere in their midst that first brings them together. They come to The Sisters of the Supreme Adoration convent by different paths, delivered by their families, each with her own complicated, heartbreaking story that she safeguards. Gwen is all Hollywood glamour and swagger; Ginny is a budding artiste with a sentiment to match; Win's tough bravado isn't even skin deep; and Vere is the only one who seems to be a believer, trying to hold onto her faith that her mother will one day return for her. However, the girls are more than the sum of their parts and together they form the all powerful and confident The Guineveres, bound by the extraordinary coincidence of their names and girded against the indignities of their plain, sequestered lives. 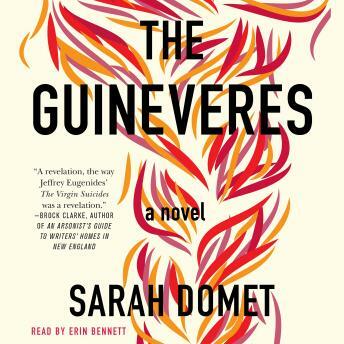 In prose shot through with beauty, Sarah Domet weaves together the Guineveres' past, present, and future, as well as the stories of the female saints they were raised on, to capture the wonder and tumult of girlhood and the magical thinking of young women as they cross over to adulthood.